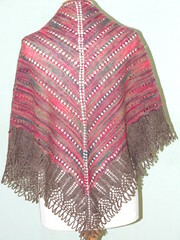 As I hoped, the blocking not only opened up the lace, which was looking very sad and crumpled when I sent it off, but also evened out the stitches in the main section, and opened up the yarn over holes. 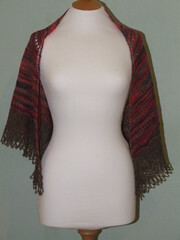 It's amazingly light to wear, and very warm, of course, being made with pure Shetland wool! 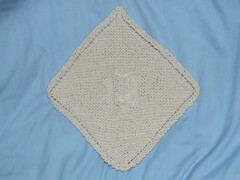 ...the Diagonal Owl Dishcloth (Ravelry link), designed by Janelle Schlossman. 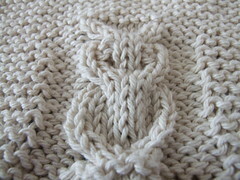 I love this pattern - it's simply and beautifully designed, fun to knit and gives such a cute result! We had a little excitement this week, as Chloe went missing for the day on Wednesday. She never goes outside, so we thought at first that she was hiding in the house. Only when we had looked everywhere did we realise that she must have slipped out without anyone noticing. She is nearly 19, so our first thought was that she had gone off to die. Everyone we knew in the village (and several people we didn't) offered to look for her, but no one could find any trace. I was coming out of the bathroom at 11.30pm, very sad and wondering if we would ever know what had happened to her, when I heard a faint meow outside the back door. First I couldn't grasp the key, then I couldn't unlock the door, but when I finally got it open, in she strolled, quite unconcerned - and bone dry. It had poured all day on Wednesday, so she'd obviously spent the day in someone else's house! I love that owl! Great work!